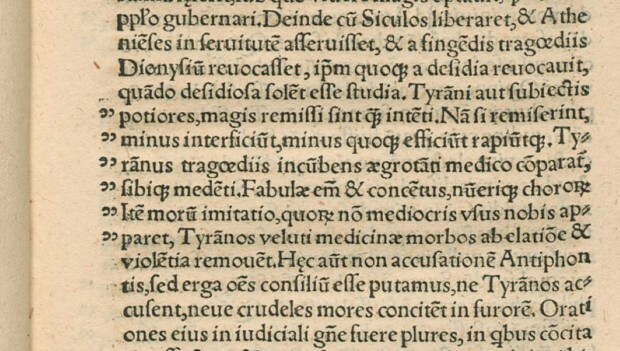 The earliest book discovered in which appeared indicia which may properly be termed marks of quotation was printed in 1516 at Strasbourg, Alsace (then in Germany), by Mathias Schurer. It was “De Vitis Sophistarum” by Flavius Philostratus. The marks consisted of two commas in the left hand margin of each page outside the regular type measure. They were placed at the beginning of each line in which a quoted passage appeared, and were evidently added after the page was set up, because their alignment varies greatly. ☛ Concerning Quotation Marks by Douglas C. McMurtrie, New York: privatly printed, 1934, p. 4. Read the whole essay: PDF. This 7 pages essay by American typeface designer and historian Douglas Crawford McMurtrie (1888-1944) was first published as an article in the Gazette of the Grolier Club in April of 1926 (no. 8). It was than privately reprinted in a limited edition of 200 (or so it says on the brochure). Surprisingly, original copies are still sold online (at the time of writing): see for example Oak Knoll and AbeBooks. ‘De Vitis Sophistarum’ by Flavius Philostratus, printed in Germany, 1516. Example of quotation marks on page 29. ‘DIalectique’ (French edition) by Petrus Ramus, published at Paris in 1555. Example of quotation marks on page 10. As we know, McMurtrie goes on mentioning the existence of quotation marks in a book ―De Vitis Sophistarum– published 39 years prior to Ramus’s Dialectique. 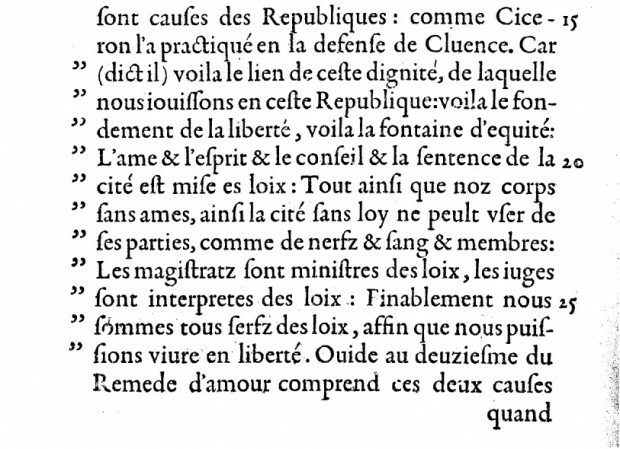 Furthermore, McMurtrie also identified the oldest known French book to make use of quotation marks: it is Geofroy Tory’s Champ fleury published at Paris in 1529, 26 years before Ramus’s Dialectique (see Gallica and the illustration below). Campagnon was wise to be only tempted by the idea of declaring the Dialectique the very first book to use quotation marks. 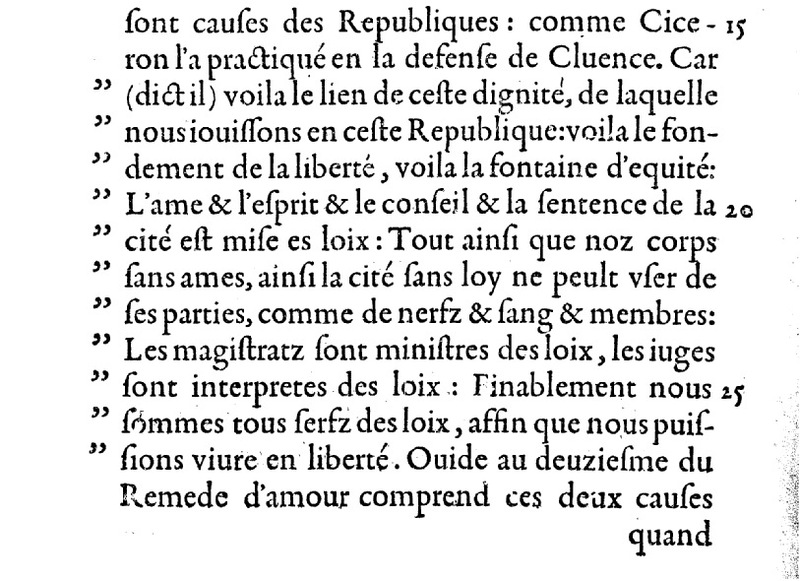 ‘Champ fleury’ by Geofroy Tory, published at Paris in 1529. Example of quotation marks on page 2r. The origins and development of quotation marks are obscure. The occasional use of marks of some kind seems to be a very ancient custom, but modern practice, systematic and largely obligatory, seems to have followed upon the invention of printing. Certainly, medieval scribal methods such as indicating citations by underlining, sometimes in coloured ink, were not readily transferable to the new technology. 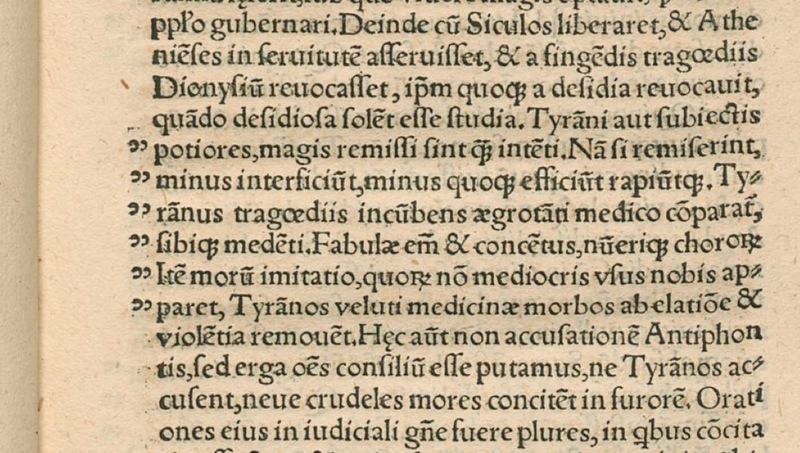 The early 1500s was when printers began to move away from printing works intended to resemble manuscripts, and quotation marks thus seem to be an aspect of that liberation: Colin Clair, A History of European printing (London, 1976), writes both that the liberating process took nearly a century from the invention of printing (p. 21), and also that it took only until around 1520 for printed books to free themselves (p. 126). Contrary to McMurtrie, Mitchell provides numerous references to support his research. His essay alone would be very interesting, but the bibliographical references in his paper makes it a truly precious document in regard to the development of the quotation mark as a typographical device. So a second route to follow is to ask where the quote marks that are so highly visible today came from. What is the origin of our familiar inverted commas? The answer would seem to lie in a little graphic sign used by ancient Greek editors to draw attention to something noteworthy in the text. Shaped like an arrowhead, it was known as the diplē (‘double’) from the two lines that formed its wedge shape. Its prime purpose was not, as now, to enclose quotations but to act as a marginal signal for drawing attention to some particular aspect of the text. In the Western written tradition, this basic shape seems to have been the root of the variegated plenitude of modern forms. Fortunately for anyone interested in those matters, Prof Ruth Finnegan’s book was published under a Creative Common license (CC BY-NC-ND 2.0). One can read it online for free or download a complete PDF copy for a small fee (about $8 USD).